Delicious banana ice cream recipes can be anything from a simple homemade banana ice cream recipe to a fabulous flaming banana foster recipe made with commercially made ice cream. All these wonderful frozen desserts are made easy today with the instant availability of bananas. They are ready for your choosing anytime all year round. The only problem with using bananas in recipes is that they darken when exposed to air; avoid this by dipping the bananas in lemon or pineapple juice. There are many delicious banana recipes made by simple scooping any flavor of ice cream on large cookies or graham crackers. Slice bananas on top of the ice cream (chopped nuts, jam or grated chocolate can also be used) and then top with another cookie or cracker. These ice cream sandwiches can be eaten immediately or wrapped and stored in the freezer for serving later. One of the most famous of all banana ice cream recipes is the banana split recipe. I always thought this delicious ice cream dessert was strictly American until I started spending time in Ecuador. I am sure the banana split started here in the United States but I never saw so many as in Ecuador. Almost every restaurant has its own version of this dessert; each more beautiful and tasty than the next. Most of the banana splits are served in long dishes called boats. Each starts with a banana cut in quarters and has about 3 scoops of delicious creamy ice cream; much is homemade. A variety of sauces are spooned over the scoops of ice cream and then it is topped with peaks of fresh whipped cream. Last there are toppings of nuts, cherries and candy crumbs. Many of the restaurants finish it off by topping with pretty little cookies standing tall in the peaks of whipped cream. Believe me; you have never had a banana split until you have one in Ecuador! One of my very favorite banana ice cream recipes is fried ice cream. Many of the Mexican restaurants offer fried ice cream but most really are not; I am always disappointed. When I ask, they assure me that they did fry it. Good fried ice cream is hot and crispy on the outside and softer on the inside. This is a hard dessert to get right. The ice cream balls have to be prepared ahead and placed in a subfreezing deep freeze. The frying has to quickly done in very hot oil or it will be lost. I am sure this is why most do not attempt to fry them. This is a fabulous dessert if you learn to make them correctly. This banana ice cream recipe has more steps but it is worth the work. Mix diced bananas in softened vanilla ice cream; divide into five balls and freeze until firm. NOTE: A large size muffin tin is good to place balls in to freeze. Remove balls from freezer, quickly roll balls in egg white, then almonds, then egg white again and almonds again. Replace in freezer until ready to fry. Garnish with sauce, whipped cream and cherry on top; SERVE IMMEDIATELY! 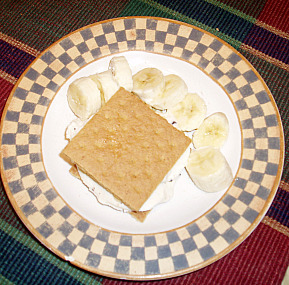 The most elaborate of the banana ice cream desserts is the flaming bananas foster recipe. There is no better way to end a special dinner than with this dessert. Cut bananas into haves lengthwise, then crosswise. Heat butter and sugar in heavy skillet until sugar is melted; cook about 2 more minutes. Add bananas and cook slowly until bananas are heated and glazed; sprinkle with cinnamon to flavor. Add the rum and carefully ignite with a long match; spoon liquid over bananas until flames go out. Serve warm bananas and sauce over scoops of ice cream. Basic of the banana ice cream recipes is homemade ice cream. Combine sugar and cornstarch in the top of a double boiler. Gradually stir in the milk. Place over boiling water and cook, stirring constantly until mixture thickens. Cover and cook for ten minutes, stirring constantly. Stir a little of the hot mixture into the beaten egg yolks; then stir them into the remaining hot mixture. Cook over hot (not boiling) water for 3 minutes, stirring. Remove from heat and cool. Beat egg whites until stiff; add salt and fold into cooled custard; add vanilla. Pour into freezer tray to freeze until firm. Remove from freezer. Beat the cream until it holds its shape and blend into the cold mixture. Return to freezer to freeze. Most banana ice cream recipes are especially good in the summertime when the children are home from school. The kids will love this one! Prepare pudding according to the package; fold in the whipped topping. Combine the bananas with the lemon juice to prevent browning; fold into the pudding mixture. Scoop ¼ cup of pudding mixture into each of the paper cups. Sprinkle each with 1 tablespoon of wafer crumbs; Top with another ¼ cup pudding mixture. Insert a wooden craft stick in the center of each; freeze until firm. 3 Bananas sliced and dipped in lemon juice. Preheat oven to 375F degrees; grease 15 X 10 X 1 inch pan, line with wax paper and grease again. Sift together flour, baking powder and salt 3 times. Place egg in bowl and gradually add ¾ cup sugar while beating mixture. Continue beating until thick and lemon colored; add flour mixture all at once and stir until blended. Melt chocolate; remove from heat and immediately add 2 tablespoons sugar, soda, vanilla and water. Fold chocolate mixture quickly into batter; pour batter in prepared pan and bake 15 minutes. Turn out immediately on a clean towel dusted with powdered sugar. Roll up cake gently in towel (cake will be 10 inches long) and let cool on rack; when cool unroll and spread with softened ice cream. Cover ice cream with thin slices of bananas; roll cake and ice cream up as jelly roll. Wrap and place in freezer until ready to serve. In a heavy 3 quart saucepan combine 1 cup sugar, flour and salt. In medium bowl beat with whisk the eggs and milk together; stir into the sugar mixture. Cook over low heat stirring constantly about 15 minutes; cool. While mixture is cooling in BLENDER CONTAINER dissolve ascorbic in water. Add bananas, 1/3 cup sugar and cinnamon to blender container; cover and process until smooth. In FREEZER CONTAINER combine egg and banana mixtures; add half and half.